Lama Kunga Thartse Rinpoche was born into a noble family in Lhasa in 1935, the son of Tsipon Shuguba, the Treasurer in the Dalai Lama’s government. At the age of 7, he was recognized as a reincarnation of Sevan Repa, a heart disciple of Milarepa, Tibet’s great 11th century poet-saint. 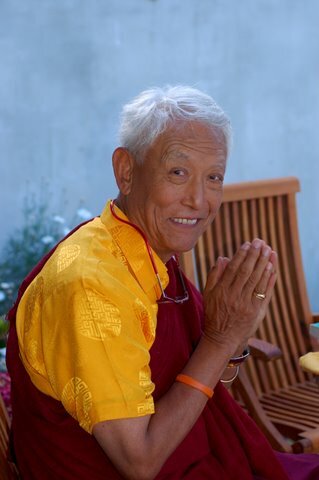 Rinpoche entered Ngor Monastery at age eight and was ordained as a monk at age sixteen. In 1959, he became Vice-Abbot of Ngor Monastery, in the Sakya tradition, but fled through western Tibet with some of his countrymen at the time of Chinese invasion. Rinpoche came to America in 1962, living in several places on the east coast. He settled in California in 1972, and soon established the Ewam Choden Tibetan Buddhist Center in Kensington, California. Lama Kunga has also taught in New Jersey, Washington, D.C., Wisconsin, Minnesota, Oregon, Utah, Arkansas, Florida, southern California, Hawaii, and in Brazil and Costa Rico. In addition to various classes in Buddhism and Vajrayana, Lama Kunga offers instruction in the Tibetan language and culture. With such a skilled and compassionate teacher, Lama Kunga Rinpoche’s students feel blessed by his close relationship to the Buddha Dharma and his kind generosity in sharing and teaching it.